A rapidly changing landscape regarding legal gambling here in the US, along with misinformation about federal laws and the confusion surrounding Black Friday all combine to make for a legality informational maze that is not so simple to navigate through. This is the primary reason this guide was developed. Our intention is to provide accurate, clear and concise information that is up to date concerning the legality and availability of online poker for United States players. We have worked hard to provide this resource so that you can take that information and make informed decisions surrounding the online poker options that are optimal for your personal circumstances and gambling preferences. The information in this guide is provided based on the combined experienced of our team of industry professionals that spans decades, and the facts of the industry in and of themselves. Poker is probably the most accepted form of gambling throughout the US, and has the best chance of integrating into legal USA based online gambling options over time. In fact, as of this writing, Nevada, New Jersey and Delaware have already made the move and now offer online poker services to their residents and visitors. Limitations do apply. For example, only players physically located within those states' borders are eligible to partake in the online poker games, which effectively eliminates most USA players. For those players who are not residing in those states, or who simply desire an expanded range of options, there are alternative poker gambling opportunities available to American players through legally licensed and regulated online poker rooms that are not based in the United States. Because these brands are located within a jurisdiction which has already legalized online poker, they are permitted to offer their services to players from around the world, including those participating in the US gambling market. What Options Do I Have For Legal Online Poker Sites Accepting USA Players? USA players that live in New Jersey, Nevada or Delaware do have some state regulated online poker options at their disposal. The ones that have been reviewed and approved for inclusion in this guide are listed below. There are also a number of legitimate offshore poker rooms that are licensed by a respected governing jurisdiction and that are subject to strict regulatory oversight similar to that which US based brands are subject to. This list is not all inclusive of all online poker sites in operation, but does represent the leading brands that are legitimately licensed and compliance certified, and subject to regular auditing of their software and fair gaming practices by third party industry agents. We are very selective concerning which poker sites we recommend in this guide, and only consider those licensed poker destinations which demonstrate a strong commitment to player safety and satisfaction, and that deliver high quality services in all areas of their operation. Below you will see those sites which made the cut to be included here, as well as a brief overview of our favorite USA online poker site. Bovada is one of the leading USA friendly online poker sites on the Web. Their game selection is stellar, and their new player bonus is a generous 100% match bonus up to $1000 on your first deposit. Poker bonuses work a little differently than casino and sports betting bonuses do as far as their disbursement, so be sure to read the terms of the offers. 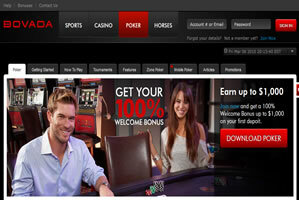 Bovada utilizes sophisticated poker gaming software to deliver fast, smooth and feature rich game play. This brand offers a mobile poker application as well that delivers Texas Holdem real money games directly to your smartphone or tablet. They are one of the very few mobile poker options that have launched. Our poker reviews are a work in progress, so please check back later. We are working on our poker strategy section, check back. This is a work in progress, so check back at a later time. What is The Status of Legal Online Poker in the United States? Online poker has been the segment of online gambling that receives the most approval from the general public when discussing state regulated options. This is because the game is largely viewed as a game of skill rather than a game of chance, which somehow legitimizes the game for many people who are opposed to other types of gambling. At the time of this writing, three states have already legalized online poker gambling for their residents, and around 10 other states are in discussions on the matter, possibly moving towards the same result. Residents of and visitors to the states of New Jersey, Nevada and Delaware are able to access state licensed online poker sites for real money gambling at this time. We expect additional legal gambling states to be added to this list in 2015. Players must be physically located within the states' borders in order to be eligible to participate in their online gambling offerings. This requirement does eliminate the majority of US players from having access to US based online poker gambling. Poker players who do not have access to the options in these states, or who simply want to see what else is out there can legally access various licensed poker sites that are regulated and based outside the borders of the United States. Some of these legal online poker jurisdictions include Canada, Costa Rica, the UK, Curacao, and Panama, among others. Licensed and regulated poker sites that are located within these respected and legitimate governing jurisdictions are able to legally offer their poker gambling services to players in the USA. There are no federal laws which prohibit US poker players from participating in real money gambling at these legal poker destinations. It is imperative that you only participate in those operations which are documented to be licensed and compliance certified, and that are subject to regulatory oversight that strictly monitors their software performance and fair gaming practices. Otherwise you may find yourself engaged in an illegal online poker business which can cause serious legal problems for you and place you and your finances at risk. The online poker sites included in this guide are all verified to be legally licensed, certified and regulated, so you will always be in a safe and legitimate situation when limiting your participation to these types of sites.